Click here to go to our main page on nonlinear devices. Click here to go to our page on cascade analysis. Click here to go to our power meter measurements page. For a linear device, output power is merely a fixed fraction of the input power. This includes most passive devices such as connectors, cable, waveguides, etc. Nonlinear devices exhibit complex behavior when input power is compared to output power. However, most nonlinear devices tend to become lossier with increasing input power. Devices such as amplifiers, mixers and switches tend to fall into this category. At some power level, the gain response of the device will become reduced by a specific amount. This power level is said to be the compression point. Quite often, microwave engineers refer to the one-dB compression point, but two or three dB compression points are often important in power amplifier chains. Thus we refer to the quantities P1dB, P2dB, P3dB. In switches and other passives, you might hear reference to 0.25 dB compression point, or some other small number. No one wants their switch to limit output power! One general point about P1dB measurements that you should know: if you are working on a transmitter or exciter (or power amplifier), it is customary to specify the P1dB point at the output (abbreviated P1dBout). 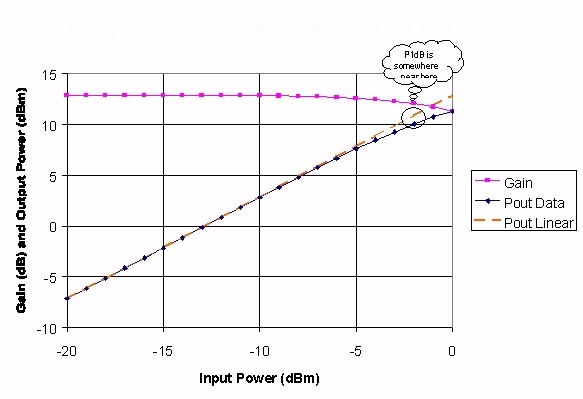 For a receiver (or low noise amp), the input P1dB point is often specified (abbreviated P1dBin). That being said, low noise amplifiers, the most critical component in a receiver chain, are most often specified with P1dB data measured at their output. If you are the receiver guy, you will need to calculate the worst-case P1dB at the input using the range of available gain that the part may provide. Why do we talk about "gain" in a passive device such as a switch or a mixer, when obviously they have no gain? Because chances are components will become part of a larger chain, which will include amplification, and we want to be consistent. As we said, most components tend to lose gain (or have increasing loss) as power levels are increased. An example of a component that breaks this rule is a voltage-variable attenuator, at least in its high-loss state. If your attenuator needs to provide eight dB, it is possible that at increasing power levels it will only provide seven dB. Unfortunately, gain compression (or expansion) is a function of attenuation setting. Obviously, if you need accurate attenuation settings, it is best to operate your attenuator below the power level where its attenuation setting is affected. Note that on attenuator data sheets, most vendors refer to "P1dB", but make no mention of gain expansion or compression. Caveat emptor! If someone has data on a variable attenuator that exhibits gain expansion, send it to us and win a cool gift! If you want your system to "act linearly", you need to stay well below the one dB compression point. This can lead to serious inefficiency, for example, you might need to use a 10 watt amp backed off to one watt output power. If your system is required to have a power amp with maximum linear range and provide good efficiency, a "pre-distortion linearizer" (sometimes simply called a "predistorter") can be used. This is merely a passive attenuator which offers gain expansion that counteracts the gain compression of the amplifier. This is one of many linearization techniques, the others are much more complicated and we won't be discussing them any time soon. The "classic" way to display power transfer characteristics is to plot the pairs of input and output power data, from linear to nonlinear operation of the device. The data is plotted, here using Microsoft Excel, and compression points are picked off the graph. 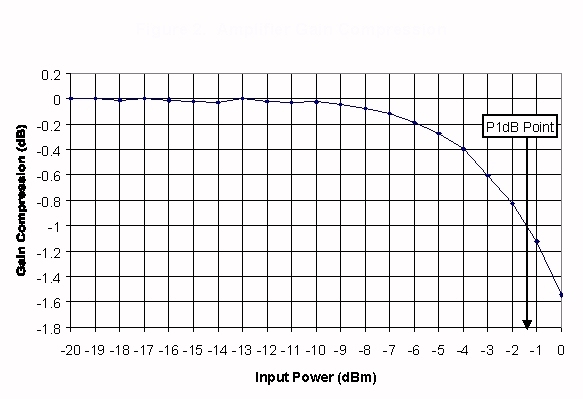 The figure below shows an example of the input/output characteristic of an amplifier measured this way (actual measured data, taken using our power meter measurement setup). The measured output power is plotted against the ideal linear response. Where these two lines diverge by one dB is noted as the P1dB point. Finding the P1dB point on this type of plot is neither convenient nor accurate. In the first picture "Pout Linear" and "Pout Data" are plotted on top of each other and it is hard to figure out the P1dB point. But if you instead plot "Pout Linear" with an output power level shift of -1dB you would end up with an intersection of "Pout Linear" and "Pout Data" which is exactly the P1dB point. Great idea! Next time we make a plot we will introduce this technique, and label the straight line "Pout linear -1dB). Note that saturated power level was not reached in this measurement. Psat is found when the slope of the Pin/Pout curve is zero (becomes horizontal). The next figure illustrates a more accurate way to find the P1dB point using the same data. Here gain compression, normalized to small signal gain, is plotted against input power. Because of the much narrower range of the Y-axis it is possible to find the P1dB point quite accurately from this graph. You can find the 0.25 dB compression point just as easily. Unfortunately, P2dB and P3dB are out of range in this measurement.